Our organism requires protein for the purpose of building and repairing tissues, boosting the immune system function, generating energy and supporting the performance of enzymes and hormones. This vegetable is packed with fatty acids and plant protein.1-cup (36-gram) serving offers 0.9 grams of protein and only 11 calories. It is also incredibly rich in vitamin K, potassium, manganese, and calcium, antioxidants and phenolic compounds.It lowers cholesterol levels. This vegetable contains a lot of protein, fiber, and vitamins. Namely, an 88-gram serving contains 3 grams of protein and up to 3.3 grams of fiber and is filled with iron, calcium, magnesium, folate, manganese, potassium, calcium and vitamins K, C, A, and B6. It prompts the development and health of intestinal bacteria and the creation of short-chain fatty acids in the gut. This cruciferous plant is high in protein, vitamin C, A, B, calcium, manganese, and potassium. One cup of chopped watercress (34 grams) contains 0.8 grams of protein and 100% of the RDI of vitamin K. This vegetable also contains phenolic compounds which prevent cancer. It is similar to kale, but has kind of a mustard taste. It is high in phenolic compounds that offer potent antioxidant properties, manganese, B vitamins, vitamin C and vitamin E, calcium, potassium, and protein. A 1-cup (56-gram) serving of mustard greens is consisted of 1.5 grams of protein, along with 348% of the RDI for vitamin K and 118% of the RDI for vitamin A.
Alfalfa sprouts are packed with nutrients and don’t have a lot of calories. 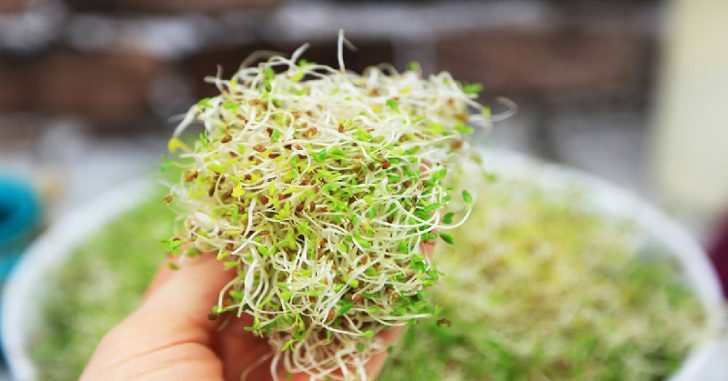 A cup (33 grams) of alfalfa sprouts has 1.3 grams of protein. It also contains iron, magnesium, zinc, copper, folate, B vitamins, phosphorus, and vitamins K and C.They reduce inflammation, treat menopause symptoms, and prevent osteoporosis. This vegetable is a nutrient bomb, it has copper, folate, magnesium, phosphorus, manganese, and vitamins A and K.A 1-cup (134-gram) serving contains 2.9 grams of protein. It has strong anti-inflammatory, anticancer and prebiotic compounds. This popular vegetable is an abundant protein source, and a cup (91-gram) serving contains 2.6 grams of protein, including all the vital amino acids. It is also packed with vitamin C, K, manganese, folate, potassium, and phosphorus.It has powerful antioxidant, anti-inflammatory benefits and reduces the risk of cancer. Spinach is a vegetable loaded with nutrients such as manganese, potassium, vitamin C, calcium, magnesium, folate, and vitamin A. It is packed with vital amino acids, and protein accounts for 30% of its calories. A 1-cup (30-gram) serving offers 1 gram of protein and 181% of the RDI for vitamin K.It reduces oxidative stress and treats inflammation. It is unbelievably rich in protein, and low in calories. One cup (100 grams) of cauliflower has 2 grams of protein and 25 calories, and huge quantities of calcium, iron, vitamins C and K, potassium, manganese, magnesium, and phosphorus.It has potent anticancer, antioxidant and anti-inflammatory components. Chinese cabbage, otherwise known as bok choy, is yet another large protein source, It is also loaded with vitamins C, K, and A, iron, potassium, calcium, folate, and manganese.One cup (70 grams) of Chinese cabbage contains 1 gram of protein. It contains anti-inflammatory properties and antioxidants. Previous ArticleThe Ultimate List of Food Producers With GMO-free Products!